'Dada Harshabardhan Bhai Gobardhan' is the endless comedy story for teenage. Author, Sivaram Chakraborty (December 13, 1903-August 28, 1980) was a delightful storyteller in Bengali literature. This great intellectual writer was born on December 1903 in Kolkata. His written stories are also delightful composition, smiles are spreading in its molecules. There is lots of writing for children. His notable works are- 'Ek Meye Byomkesher Kahini', 'Premer Dwitiyo Bhag', 'Babum Bubum Boom! ', 'Panchananer Ashwamedh', 'Prothom Dhakkay Chit Potang' and many more. 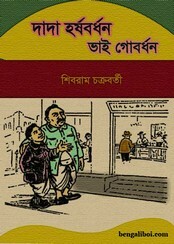 Now I want to share a Bangla comedy book of this author- 'Dada Harshabardhan Bhai Gobardhan', stories are- 'Dokane Gelen Harshabardhan', 'Dhumraloke Harshabardhan', 'Dakrat Daklen Harshabardhan', 'Harshabardhaner Upor Tekka', 'Dourbazi Dekhlen Harshabardhan', 'Harshabardhaner Upor Batpari' and 'Chor Dharlen Gobardhan'.